Curbed wheels look terrible and tell the world that parallel parking may not be one of the merit badges on our sashes. Thankfully, there are professionals who can take care of curb-rash scars. Detailer AMMO visited Proformance Industries to understand how the pros repair a curbed wheel the right way. Obviously, there are ways many drivers may choose to fix a curbed wheel at home, but to ensure a factory-fresh look, it’s probably best to leave it to the professionals. First, the company checks that the wheel is balanced and there’s no major damage. If there is, technicians repair that wheel before it heads off for cosmetic repairs. The wheel is dunked into a stripping tank where chemicals eat away at its finish. 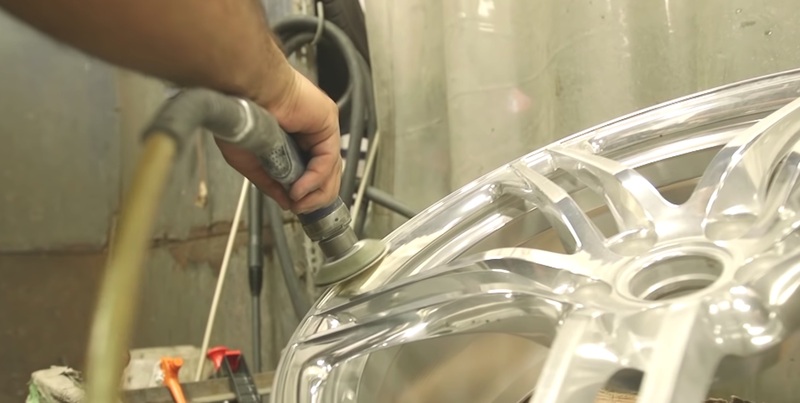 A power washer removes old paint and restores the wheel back to pure metal. The shop says they have a sandblaster, but it’s often not as effective as the stripping tank, especially for intricate wheel patterns or antique wheels. Even so, when they fire up the sandblaster, the shop uses recycled plastic that won’t damage the surface like sand can. It’s also much better for the environment. From there, a technician tackles the road rash. A word of warning: Machining past the damage isn’t the right way to repair the wheel. The surface area will be thinner and sharper, and more likely than not, all it will take is a pothole to cut the tire. Machining past the damage also changes the shape of the wheel. Instead, the goal is to “kiss” the surface to maintain the same shape and fix the scuffs as finely as possible. After a quick wash, various grits of sandpaper are used to delicately sand away the damage and leave a flush surface. The shop’s repairs to the wheel are nearly invisible.